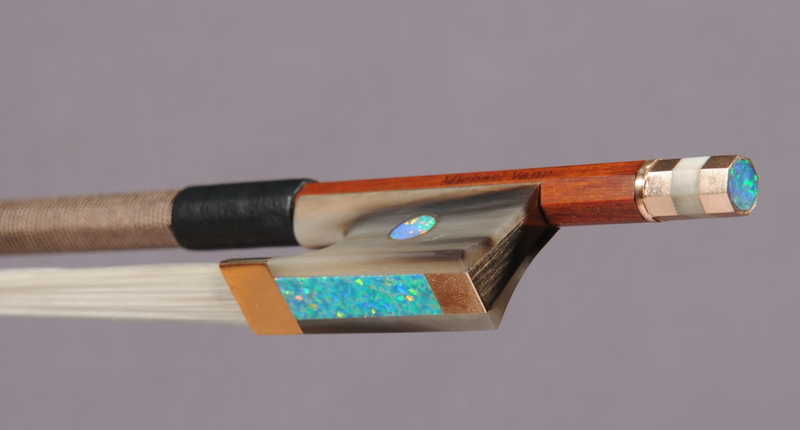 Violin bow with a round shaft of Pernambuco, bison horn frog finished with rose gold, synthetic opal and a French silk wrap. This bow is made with a rounded shaft of pernambuco and finished at the head with a rose gold face plate. It is mounted with a bison horn frog. The button is of the divided gold type on a bison horn core. The frog is inlaid with synthetic opal eyes surrounded with a gold ring on both sides. The slide is also synthetic opal. The wrap is of French silk and finished with a leather grip.